Sri Radhakrishna Iyer, the then Principal of the Maharaja’s College, Pudukottai. 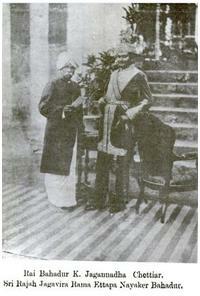 Subbarama Dikshitar singles out his benevolent patron His Highness Raja Jagadveera Rama Venkatesvara Ettappa who ascended the Ettayapuram throne in December 1899, in his preface saying he was eternally in gratitude to the Raja for having provided him with the support to bring out the SSP and thus making him famous. It was to this ruler that Chinnasvami Mudaliar earnestly appealed to convince Subbarama Dikshitar to document all that he knew. And it was under this Raja’s direction that Subbarama Dikshitar embarked on the creation of the SSP. And on top the Raja sanctioned a princely sum of Rs.10,000/, arranged for importing the typesets and the machinery so that Vidya Vilasini Press could complete the production of the entire treatise with all its notations. December 2010 marks the Raja’s 132nd birth anniversary as well the 111th anniversary of his coronation in the year 1899 which was when the groundwork was done by Chinnasvami Mudaliar to get the task of collating the SSP started. According to Dr. T. S. Ramakrishnan, the actual work began on 21 December 1901 (a full two years later) and ended with the publication of the SSP on 15th February 1904. This article is to commemorate the memory of Raja Venkatesvara Ettappa and that of the Royal House of Ettayapuram without whom the magnum opus would not have seen the light of the day. And the musical tribute is through a chef-d’oeuvre conjured up by Subbarama Dikshitar, a bewitching cauka varna in the raga Surati, along with 3 rare compositions of an Ettayapuram ruler. Ettayapuram is today a small town in the district of Tuticorin in Southern Tamilnadu. Prior to the British annexation in the year 1775 (appr), it was a principality ruled by Poligars/Kings with quasi independence having the Vijayanagar Kings or the Nayaks of Madura as their overlords. We do have historical accounts of this royal family from the British chronicler Robert Caldwell. In the local language, we have the historical account of one Swami Dikshitar (circa 1860) who was patronized by the Ettayapuram Royals, called “History of Ettayapuram” which provides the lineage of a total of more than 30 rulers, till 1870. Apart from this, as mentioned in the introduction, Subbarama Dikshitar has provided a brief biographical sketch of the Royals of Ettayapuram in his Vaggeyakara Caritamu. The Ettayapuram Royals have also been profiled by Sri A Vadivelu (a chronicler of Indian royal families from the last century), Dr T S Ramakrishnan (a past member of the Experts Committee of the Music Academy) and Dr V Raghavan. The members of the Royal House and the rulers during the period of 1775-1905 are given in the genealogy chart below for reference. Quite a few musical books and historical accounts, given the commonality of names of the different Rajas, give a confusing account of the Rajas mixing them up and also wrongly attributing compositions. For example, many publications blindly attribute all available compositions to Kumara Ettendra. For the sake of clarity I have documented the correct Raja name as attributed by Subbarama Dikshitar and cross-validated with other accounts as found in the references section, in the footnote. The history of the Royal House of Ettayapuram apparently traces back to circa 856 CE. However, evidence in the form of historical documentation is traceable only from circa 1423 CE onwards. There is a stone inscription in the town of Devikapuram dateable to 1479 AD that mentions of Ettappa Nayaka making available devadasis to the temple. There are also stone inscriptions dating to 1690 which talks of the acts done by Nayakas of Ettayapuram. Throughout this article and also in all historical accounts, the principality of Ettayapuram is referred to synonymously as a palayam or zamindari or estate or samasthana(m) and those in-charge are addressed as King, Raja, Zamindar and poligar. The names of the rulers/zamindars are usually prefixed by Jagadveera and the common suffixes include Ettappa, Ettendra, Ayyan, Pandian and Nayaka(n). The Rajas of Ettayapuram were originally called Nayaks/ Nayakkar with a common surname of Ettappa Nayaka and were a warrior clan hailing from the Chandragiri region which is in modern day Andhra Pradesh. They had been local chieftains who then moved into the Madurai region and became a vassal of the Pandyan Kings in 1423 CE. According to Robert Caldwell (‘A History of Tinnellvely’ p.49) Kumaramuttu Ettappa Nayaka, an ancestor of the Ettayapuram Rulers fled from Chandragiri with his huge retinue to the Madurai region fearing reprisal from the Bahmini Kings. They perhaps represented the first wave of Telugu speaking people to migrate to the Tamil hinterland. The Pandyan Kings conferred the title of ‘Jaga(d)veera Rama’ on these chieftains which is used by them till today. The 20th Ruler in this line was one Raja Jagaveera Ramakumara Ettappa Nayaka who in January 1567 (vide Henry Heras’s ‘The Aravidu Dynasty of Vijayanagara’) founded the present day Ettayapuram and moved his headquarters there. Bishop Caldwell in his book ‘Political and General History of Tinnelvelly’ records the year as 1565. During the 1500’s, when the Vijayanagar Empire was at its zenith these chieftains of Ettayapuram became poligars (or palayakkarar in Tamil i.e royalty paying Chieftains) under the overall suzerainty of the Vijayanagar Kings. The Nayakas of Madura and Tanjore were higher in terms of their pecking order while the Nayakas of Ariyalur, Gingee, Udayarpalayam and Ettayapuram were next in line. The Nayakas of Ettayapuram were on very friendly terms with the Nayakas of Madura and in turn they were conferred the title of ‘Ayyan’ oor the support and friendship that was extended. They Nayakas of Ettayapuram were also granted the village of Kazhugumalai in 1500’s. The temple of Lord Subramanya was constructed by the Ettayapuram rulers there and the Lord enshrined therein became the presiding deity of the Royals from then on. During early 1800’s when the British consolidated their hold over Southern India, the Ettayapuram rulers like the rest of the others followed suit and became vassals of the British and became kist/peshcush paying Zamindars. 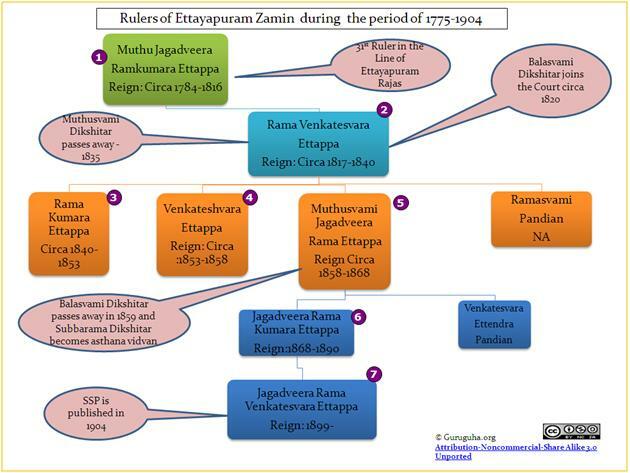 The Rajas/Zamindars of Ettayapuram (those who are given in the genealogy chart above) have been profiled in detail by Subbarama Dikshitar in his Vaggeyakara Caritamu and I refer readers to the same available in English online. The Rajas were patrons of music, arts and literature. Subbarama Dikshitar lists out a number of great musicians and poets who ornamented the Nayaka Court at Ettayapuram. The famous Tamil poet Kadigaimuttu Pulavar, who was patronized by the Royals, wrote a panegyric of a 100 Tamil verses on Raja Venkatesvara Ettappa (marked as Ruler 2 in the genealogy chart above), was patronized by the Ettayapuram Royals. Above is an excerpt from that work called ‘Samudravilasam’ extolling the Raja. As Subbarama Dikshitar points out, the Rajas and the family as whole were great patrons of arts and culture. Some of the rulers were also composers in their own right, such as Rama Kumara Ettappa Maharaja or Kumara Ettendra (as he is named in the SSP), who ruled between 1840 and 1850. The SSP lists out 13 compositions of this Raja Kumara Ettappa (herein after referred only as Kumara Ettendra) such as ‘Gajavadana Sammodita’ in Todi, ‘Karunananda Catura’ in Neelambari and ‘Sivananda Rajayoga’ in Surati with the ankita ‘kartikeya’. The discography section features three of his compositions. See Foot Note 1 for a compilation of the compositions of the Rajas of Ettayapuram. Some of compositions of Kumara Ettendra given the style and also considering the fact that they were on Lord Subramanya have been mistakenly attributed to Muthusvami Dikshitar himself by the Taccur Brothers in their works/publications. Apart from the musical contributions, the Rajas have also contributed to arts and literature especially. G U Pope’s and L D Barnett’s “Catalogue of Tamil Books in the British Museum Library’ in two volumes, bear out that Raja Venkatesvara Ettappa had written a Tamil drama in three acts called ‘Gnanavalli – A Creeper of Wisdom’ with an English translation by S A Tirumalai Kozhundu Pillai, published in 1915. Subbarama Dikshitar also lists out the contributions and literary acumen of the personalities from this family in the Vaggeyakara Caritamu. The name of these Rajas came to be sullied in history in relation to the episode of the capture of Kattabomman, the polygar of the neighboring Pancalamkurici, dating to the year 1799. See Footnote 2. It would be befitting to formally record what is known of these two eminent personalities instrumental in the publication of the SSP. Profile # 71 of the Vaggeyakara Caritamu of Subbarama Dikshitar is of Raja Rama Venkatesvara Ettappa. Rama Venkatesvara Ettappa was born in December 1878 as the first son of Raja Rama Kumara Ettappa who reigned between 1875 and 1890. When Rama Kumara Ettappa died in circa 1890, Venkatesvara Ettappa was a minor and hence could not ascend the throne. The British instrumentation of Court of Wards was invoked and the minor Raja was placed under the care of a group of Englishmen and an Indian. Mr.Potts, Mr.Ellison, Mr. Morrison, Mr.Payne and Sri.Jagannadam Chettiar were handpicked by the Court of Wards to handhold the minor Raja till he attained the age of 21. Till the minor Rama Venkatesvara Ettappa attained majority in 1899, this group of tutors kept a watchful eye as guardians and ensuring he was educated and well informed. He was taken around the country and to Sri Lanka to make him worldly wise as well. The affairs of the Zamindari Estate, was in the meanwhile first handled by Sri Venkata Royar and then by Sri Sivarama Iyer as the Dewan or Manager working under the supervision and control of the British Collector. Sri Sivarama Iyer was also the tutor/guardian of Raja Bhaskara Sethupati who was profiled in an earlier article. Rama Venkatesvara Ettappa’s paternal uncle (brother of Raja 6 in the genealogy chart), Venkatesvara Ettendra Pandian took significant interest in running the zamindari during the Raja designate’s minority. This Venkatesvara Ettendra Pandian is also mentioned by Subbarama Dikshitar as a great patron and connoisseur of music and arts. Apparently there were litigations galore between Rama Venkatesvara and his uncle as well. It may not be out of place to mention here that Krishnasvamy Ayya (whose compositions are notated in the SSP) was a solicitor/advocate, who had his residence in Tirunelveli and it was he who handled litigations in connection with the Zamindari and provided legal advice to the Royals. Rama Venkatesvara Ettappa attained majority in the year 1899 and he became the Zamindar/Raja in December of that year. His marriage was also performed just before this coronation. Upon his ascension, Raja Rama Venkatesvara Ettappa made K Jagannadam Chettiar as the Manager of the Estate/Dewan. Jagannadam Chettiar was also honored with the title of ‘Rai Bahadur’. Records indicate that he was an officer of marked ability, unblemished reputation and long experience. Jagannadam Chettiar during 1904 retired from service on a hefty pension and was succeeded by Mr. S T Shanmugham Pillai who had earlier served as a Deputy Collector. Raja Rama Venkatesvara Ettappa was also a patron of Subramanya Barathi the renowned tamil poet and freedom fighter. Raja Rama Venkatesvara Ettappa Nayaka died circa 1915. In the SSP the lyrics of the first composition are also found notated additionally under ragas Anandabhairavi and Vasanta. The second composition is also notated under Sankarabharanam. Did Subbarama Dikshitar set the lyrics to these ragas? One does not know. The third composition is found notated in the 1905 work of Subbarama Dikshitar, Prathamabhyasa Pustakamu and was probably composed post 1902. Subbarama Dikshitar has composed two varnams, a padam and a daru in honor of these two personages. Compositions 1 and 2 are found in the SSP, 3 in the Anubandha and 4 in the Prathamabhyasa Pustakamu. Compositions 1-3 are in honor of Raja Rama Venkatesvara Ettappa. In the case of composition 3, the telugu lyrics have been composed by Sri Jagannadam Chettiar and Subbarama Dikshitar has set it to music and is in honor of Raja Rama Venkatesvara Ettappa. Composition 4 is an ode on Sri Jagannadam Chettiar composed by Subbarama Dikshitar. This daru is constructed with a crowning makuta svara or muktayi svara passage which has sahitya as well. No known renderings of these compositions exist. 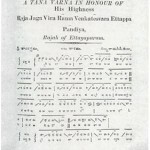 In this section, four compositions are sought to be presented as a musical tribute to the munificent benefactor Raja Rama Venkatesvara Ettappa and his Royal House. 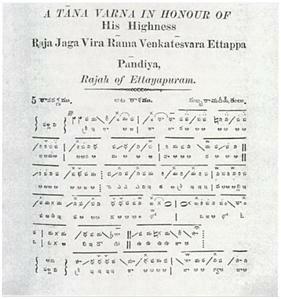 The first is a cauka varna composed by Subbarama Dikshitar on his patron Raja Muttusvami Jagadveera Rama Ettappa who ruled between 1858-1868. This Raja is marked with the number 5 in the genealogy chart above and is profiled by Subbarama Dikshitar in the Vaggeyakara Caritamu under serial number 69. Also known as Muddusvami Ettendra this Raja was the grandfather of Raja Rama Venkatesvara Ettappa who ascended the throne in 1899 and was instrumental in funding the publication of the SSP. The text of this cauka varna is available in full in all its regal splendor in the SSP. Set in rupaka tala and the raga Surati, the varna is a connoisseurs delight. It is also encountered in the dance circuit and is performed in full as the center piece. Before we present the rendering of this composition, Prof S R Janakiraman talks first of raga Surati and how Subbarama Dikshitar has handled the elongated dhaivatha of raga Surati in the varna. It’s not without reason that the Professor says that the varna is a veritable encyclopedia of Surati. The raga called as Sorata or Surati is clearly a post 1700s raga with a skeletal arohana/avarohana murrcana of SRMPNs/sNDPMGRS which it shares with Kedaragaula. And without doubt it’s a documented melody of Muddu Venkatamakhi and not of Venkatamakin as the raga is not found in the Caturdandi Prakashika. It is to be noted that the avarohana murrcana sNDPMGPMR is a later day refinement. On the authority of the kritis of Muthusvami Dikshitar and of the adi tala tana varna of Veenai Kuppaier, ‘Ento Prema’ we can say that sNDPMGRS is the older or in terms of today, a rather visesha avarohana krama. In this raga, the notes gandhara and dhaivatha are not intoned at their respective svarasthanas as applicable for Kedaragaula/Harikambhoji mela. Rather the gandhara is rendered close to/as madhyama and the dhaivatha close to the nishada itself. Surati is thus a raga to be dealt with and understood from lakshya rather than lakshana. The dhaivata that is found documented in Subbarama Dikshitar’s composition is elongated in its intonation, rare and has been so used in Muttusvami Dikshitar’s Surati compositions including ‘Angarakam’ and ‘Sri Venkatagireesam’. Apparently the composition was learnt by the Professor from Tiruppamburam Svaminatha Pillai in the company of Sangita Kalanidhi T K Govinda Rao. Years ago in an Academy concert as Sri Govinda Rao was rendering this mammoth composition, he beckoned over to Prof Janakiraman who was in the audience to join him in rendering the remaining portion of the varna! In sum this composition in its pristine glory exemplifies the greatness of Subbarama Dikshitar as a musicologist and as a composer par excellence. Next is a composition of Kumara Ettendra’s ‘Karunananda Catura’ in Neelambari. Vidushi Padma Varadan the daughter of renowned musicologist and veena vidvan Sri Rangaramanuja Iyengar, who passed away some time back, renders this gem of a composition. This rendering is a one to cherish for its singular beauty and aesthetic presentation of a very high order. The source of this patham of the composition ‘Karunananda Catura’ could be interesting to know. This composition of Kumara Ettendra dates back to the time when Balusvami Dikshitar was the Court Musician or astana vidvan of the Ettayapuram Court. Whether he played any role in contributing to this creation, particularly in terms of the musical setting, is not known. For example, the cittasvara section of the Todi composition of Kumara Ettendra, ‘Gajavadana Sammodita’ with its emphasis on the different shades of the gandhara svara is a creative addition of Balusvami Dikshitar. In this case Subbarama Dikshitar clearly marks it as a composition of Kumara Ettendra himself. It is not known for sure how this Neelambari composition went on to ornament the repertoire of the legendary Veena Dhanammal. Was it through Satanur Pancanada Iyer/Panju Iyer by any chance as it was also known to Tiruppamburam Svaminatha Pillai also given that Panju Iyer taught both Dhanammal and Tiruppamburam Natarajasundaram Pillai? One does not know. Dhanammal’s Friday musical soirees featured for sure a rendering of this composition on the veena to the solitary accompaniment of her lilting voice. Rangaramanuja Iyengar for sure must have learnt it as rendered by the femme royale of our music of the last century and passed it on to his daughter. Not surprisingly, Vidushi Padma Varadan renders vocally the song even as she plays it on the veena in a style typical of Dhanammal herself. Attention is invited to the madhyama sruti rendering of this composition which gives Neelambari a different lilt and hue. This section concludes with the renderings of two other compositions of Kumara Ettendra which are extremely rare. Featured first is a rare rendering of Kumara Ettendra’s composition in Surati, ‘Sivananda Rajayoga’. Again this recording is from an AIR Concert of Vidushi Padma Varadan from the year 2008. Incidentally these two compositions namely ‘Karunananda’ and ‘Sivananda’ seem to be part of a set of compositions (the ‘Ananda’ series) which are listed in the SSP as composed by Kumara Ettendra. The others in this so called series are ‘Nityananda’- Asaveri, ‘Nikhilananda’ – Saveri and ‘Paramananda’ – Bhairavi. It’s worth noting here that the text of this Surati kriti features the word ‘pranava hrimkara’ being repeated four times as the starting point for each of the carana lines of the kriti. Presented finally is Kumara Ettendra’s Sriraga composition ‘Shadadhara tatva’ rendered by Vidushi Srirangam Gopalaratnam. As one can see that the composition is melodically modeled on Muttusvami Dikshitar’s Sriraga composition ‘Sri Muladhara cakra vinayaka’. While Dikshitar’s creation does not feature the vakra dhaivatha usage, this composition as per practice utilizes the dhaivatha via the murccana PDNP just once in the kriti and once in the cittasvara section. The audio recordings and photographs in this blog post have been used purely for educational/research purpose and is covered by fair use and the copyrights for the same vests with the authors/performers as applicable. I am grateful to Sri Naresh Keerthi for providing me with a copy of the recording of ‘Shadadhara cakra’ in Sriraga. Kumara Ettendra refers to Kumara Ettappa Maharaja (name found in the SSP), the raja listed with number 3 in the genealogy table above and 67 in Subbarama Dikshitar’s listing in Vaggeyakkara Caritamu. Rama Venkatesvara Ettappa refers to the Raja listed with number 7 in the table and 71 in Subbarama Dikshitar’s listing. Of the above barring the two compositions the source/publication of which are given in braces, the rest are found notated in the SSP and its anubandha. For an academic analysis of the compositions of the Ettayapuram Royals, readers may please refer to the Journal of the Music Academy Volume LXII 1991, pages 82-94, ‘Compositions of the Ettayapuram Rulers’ by Dr Gowri Kuppusvami and Dr N Hariharan. It needs to be mentioned here that popular historical/folklore accounts also reference the Rajas of Ettayapuram in poor light in the context of the episode relating to Veerapandiya Kattabhomman the chieftain/poligar/palayakkarars of Pancalamkurici. So much so that in Tamil vernacular, the word ‘Ettappan’ is used to signify a person who performs an act of betrayal or treachery. The popular version of the story/events is that Veerapandiya Kattabomman, the recalcitrant poligar of Pancalamkurici, who had defied the British Raj was caught by the British with significant assistance from Raja Muthu Jagadveera Ramkumara Ettappa (1784-1816) and executed. This popular version is recorded for posterity by Ma.Po.Sivagnanam (1980) in his work ‘The First Patriot Veerapandiya Kattabomman’ which for all purposes is relied upon as authentic account by the general public. We do have older versions of this incident by Caldwell and others as documented in the ‘Political and General History of Tinnelvelly’. The facts as it appears documented is that, right from day one the Rulers of Ettayapuram were not at all on friendly terms with the polygar of the neighboring Pancalamkurici namely Kattabomman. Kattabomman and his kinsmen seem to have raided the villages under Ettayapuram as well as other neighboring polygars and were plundering them regularly. And on top Kattabomman was refusing to submit himself to the British sovereignty. In the face of such belligerence, the British launched an offensive to capture Kattabomman and sought the assistance of all the friendly poligars of the area. The chief support thus came from the Ettayapuram Raja. Accounts have it that Kattabomman even came down to Madras and had an audience with the British Governor. He offered gifts to the Governor and in turn was showered with gifts and pardoned by the British. The truce apparently was short lived with the Pancalamkurici polygar reverting to his ‘old ways’ in the eyes of the British. With the British Collector Mr.Lushington at the helm of affairs, the operation to quell Kattabomman took place between 17th August and 21st Oct 1799 and it set Kattabomman on the run. And in the end he sought refuge with Raja Tondaiman of Puducottai who took him into custody and handed him over to the British. Thus it is indeed open to question whether such an unfortunate consequence of being branded a traitor or performer of an act of betrayal can be fastened on to the Ettayapuram Ruler who had provided overt logistical support to the British and had not acted covertly/treacherously. And neither does history record the Ettayapuram Rajas as having played any role whatsoever in the final capture of Kattabomman at Puducottai. And yet reality is that it has come to stay as part and parcel of Tamil history that it was the act of betrayal by the Raja of Ettayapuram that cost Kattabomman his life with their royal name being besmirched with the taint of treachery and betrayal. Readers may refer to Kanakalatha Mukund’s ‘The View from Below: Indigenous society, Temples and the early Colonial State in Tamilnadu, 1700-1835’, published by Orient Longman, pp 176-185 and “A Manual of the Tinnevelly District in the Presidency of Madras” by A J Stuart pages 54-58 which sums up the entire sequence of events as documented by Caldwell and in traditional tamil ballads. The account of the British Collector Mr.Lushington and his appreciation of the role played by the Rajas of Ettayapuram as a loyal tribute paying principality are recorded in the pp 543-546 of “The Fifth Report from the Proceedings of the Select Committee on the Affairs of the East India Company ( Madras Presidency)” Volume 2 (1812). Interestingly this question came up for judicial resolution before the Madras High Court in 2008 when a Tamil movie was named ‘Ettappan’ and the descendants of the Ettayapuram royal family sought to restrain the producers from naming the film so with a negative connotation.